This is the video for my Skookum Tech Talk on August 26, 2016. For the cited papers, videos and slides of my talk, go to mikeclaffey.com/skookum. This entry was posted in Uncategorized on August 26, 2016 by mclaffey. This entry was posted in Uncategorized on May 27, 2016 by mclaffey. Also makes the text smaller (assuming you are rotating because of long labels). Use position='dodge' when you are okay with the default behavior. Use position=position_dodge(width = 0.90, height=2) when you want to control the behavior. If you use scale_y_XXX(limits=c(50, 100)), any graph object that falls outside that window at all will be completely removed from the figure, even if a different portion falls within the limits. To avoid this, use the following to 'zoom' in the figure, without changing what objects are included. Think of hjust as the percentage of the text's horizontal width that is left of the anchor point. So 0 means 0% of the text is left of the anchor point, so this is left justified. 0.5 means 50% of the text is left of the anchor point, so the text is right justified. 1 is 100% is right justified. vjust is the percent of height **below** the anchor. A way to remember this is that for an anchor point at 0,0, and with hjust=vjust=0, the text would appear properly in upper right quadrant from the origin. Note that if the text is rotated, the justification is applied before the rotation. For example, text with hjust=0 and vjust=1 is right of and below the anchor point. If it is then rotated 90 degrees counterclockwise, it ends up right of but above the anchor point. The default theme doesn't have enough space between axis text and tick marks. This entry was posted in Uncategorized on May 2, 2016 by mclaffey. This entry was posted in Tech on March 18, 2016 by mclaffey. Below is the source code for the ggplot theme_grey, as found here. This is useful when creating your own customized theme, as it covers most of the available elements and how to adjust them. This entry was posted in Tech on February 19, 2016 by mclaffey. Set up a hard drive that is bootable to either OS X 10.6 or Ubuntu, but with a shared user partition so that user data is accessible regardless of which operating system is booted into. This entry was posted in Tech on January 20, 2013 by mclaffey. Goal: Convert a Flash .flv file to .mov on OS X.
I’ve used ffmpeg before and knew this was a good tool for the job, but hadn’t used it in awhile and wasn’t sure I even had the binary installed. This entry was posted in Tech on January 1, 2013 by mclaffey. Every month I make a playlist of random songs I come across (mostly from hype machine). 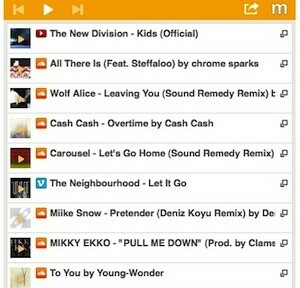 Below is December’s playlist, which you can play directly with Minilogs‘s embedded player. Here’s a post I wrote about finding the right embedded playlist solution. This entry was posted in Music on December 20, 2012 by mclaffey. This entry was posted in Tech on December 20, 2012 by mclaffey.